Learn to use the Jubilee quilting rulers that coordinate with the BERNINA 125th Anniversary Quilt designed by Amanda. 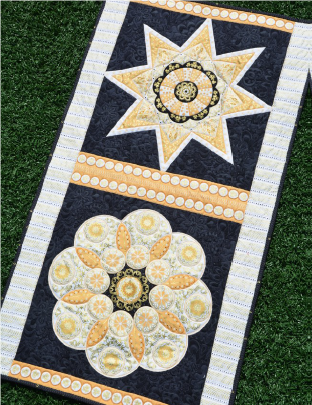 Along the way, you'll learn how to use circles and straight lines to create dynamic blossom and medallion designs on any quilt! The ﬁnished piece would make a spectacular table runner or bag! ASC will supply Sewing Machine with #72 foot, Fabric Kit, snips, thread and needles. If you would like the following items feel free to bring them to class. Quilting Gloves, Supreme Slider or Free-Motion Glider, Favorite thread snips, Favorite Marking tool.